Here’s a fact that may shock some: I like the Prius. It’s no drag racer, it can’t overtake a BMW M3 coming out of a corner, it doesn’t have a symphony coming out of its exhaust pipe and it doesn’t conjure up any sort of emotional attachment to it. It is, for all intents and purposes, basic transportation. But that’s alright. I still like it. Mechanically and technology-wise, it’s impressive. And when I admit it aloud, laughter immediately ensues and suddenly I’m branded as a nerd who no longer deserves to review press cars. But I don’t care. You, on the other hand, may care. The Prius name is synonymous with ‘nerd-mobile’ after all. The newest version has some of the most polarizing looks I’ve seen on any car in a long time and inside looks like it came straight out of Star Wars (and not in a good way). Most models come with tiny shopping cart-like wheels to boot. If you’re environmentally conscious or you just don’t enjoy spending so much of your hard earned gas to nourish your car, then the Prius makes the most sense. 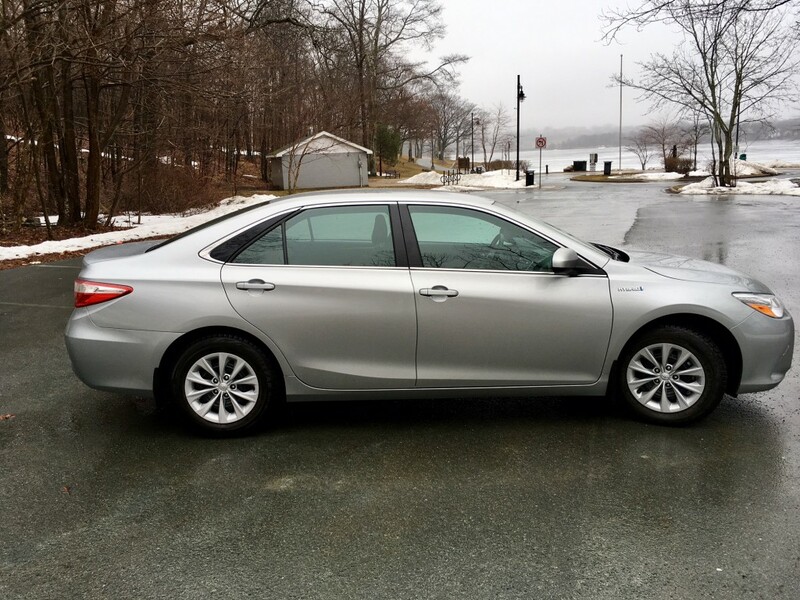 But if you don’t like the idea of owning one and are looking for something that might blend in a bit more, here is the car for you: the Camry Hybrid. And if blending in is really what you’re after, spec out your Camry Hybrid exactly the way my press car is spec’d out. 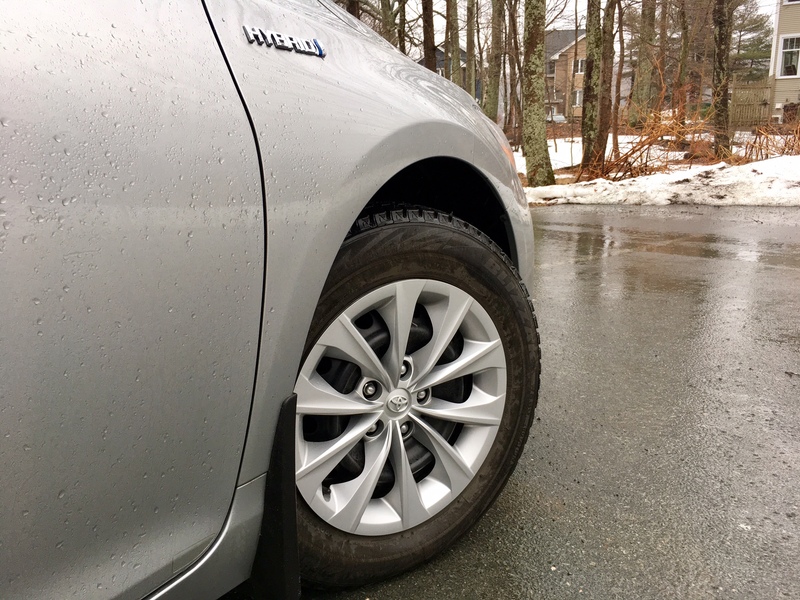 Go with the base trim in yawn silver with 16-inch steel wheels that admittedly do a decent impression of an alloy wheel. If you’re the type that doesn’t want anyone to know you’re driving a hybrid, then again, this is the car for you. There are two hybrid decals on the sides of the car and one inconspicuous one on the trunk lid. And aside for some blue trim around the Toyota badges, there is nothing else that spills the beans on your hybrid purchase. There are no hybrid-specific wheel designs, or headlight designs or trim designs added. There isn’t a whole lot to say about the exterior other than it’s non-offensive looks will likely put off nobody, in part, because they won’t even notice you in the first place. If you are the type that prefers a bit more attention to their ride, and in a good way, then you may want to wait for the all-new 2018 Camry Hybrid to go on sale later this year. The simple theme continues inside as well. All the controls are where you need them to be and quality isn’t bad for a base model, though you can easily find some hard plastics if you go looking for them. 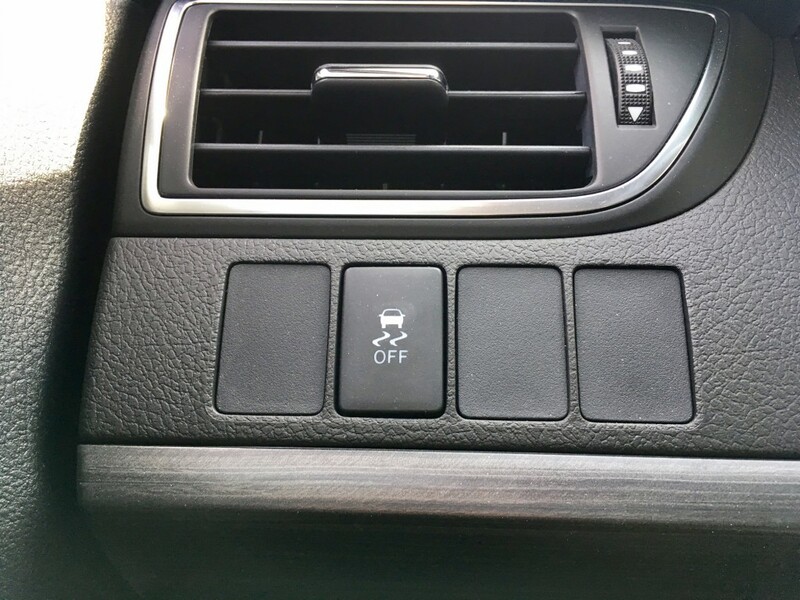 You are constantly reminded that you opted for the base model with a lack of buttons and plastic coverings for where they would normally be along with certain features missing such as heated seats. That said, certain niceties are standard such as keyless entry and push button start along with automatic head lights and dual zone climate control, but for 30 grand I would expect a bit more content, base model or not. The tachometer gets replaced with a gauge which measures how economically you are driving, when you are using the most power from the electric motor and when the battery is being charged, which occurs every time you brake or coast. In the centre is a small screen which houses most of the computer read outs such as current and average fuel consumption. On the infotainment screen on the centre stack is where your report card will come up after each trip, grading you on how efficiently you drove. This may seem a bit like a lecture, but it’s actually an effective tool at helping you to adjust your driving style for efficiency in mind. 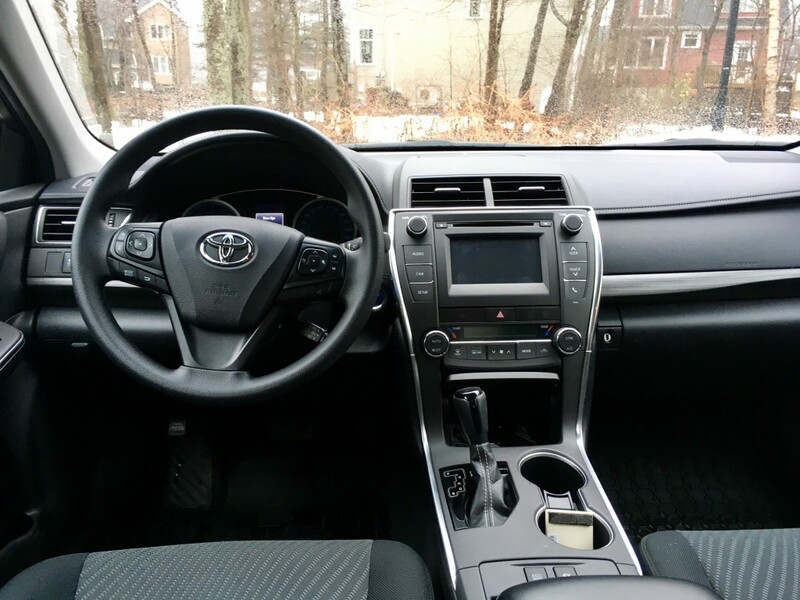 The Camry has always had a good amount of interior space and this remains true for the hybrid version. 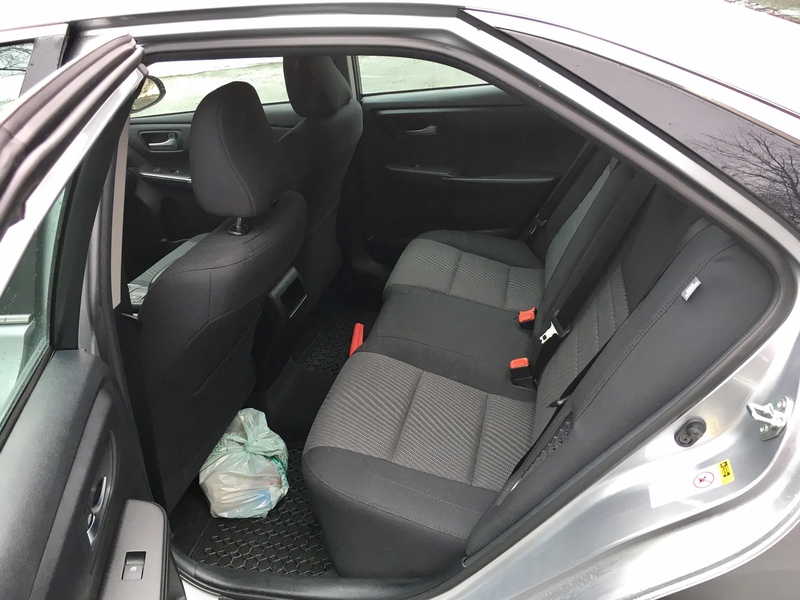 Rear passengers should have few complaints about leg room. But cargo room takes a bit of a hit in order to house the battery. 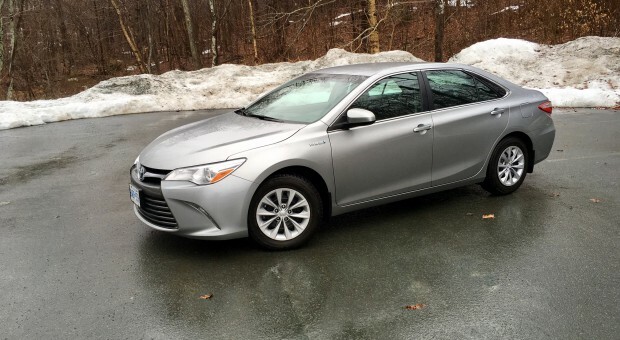 You get 13.1 cubic feet compared to the non-hybrid Camry’s 15.4. That isn’t a massive difference which is good but it should be noted that the Prius outdoes them both with its 24.6 cubic feet of cargo room. As you might expect, there isn’t a nuclear bomb under the hood of the Camry hybrid; it’s a 2.5 litre 4-cylinder engine. But, when combined with the electric motor, it puts out a healthy 200 horsepower. This means that it has plenty of pick up for the average bear; more than enough to suit most people’s needs. However, this power is mated to a continuously variable transmission (CVT) whose job is to keep the engine and your right foot in check. It’s a transmission that ensures fuel efficiency stays the top priority most of the time. While it isn’t the noisiest CVT I’ve ever tested, it still does a decent job of sucking your soul. If you’re looking for a more conventional transmission to go with your hybrid, Hyundai offers their Sonata hybrid with a less intrusive and more engaged six-speed automatic. 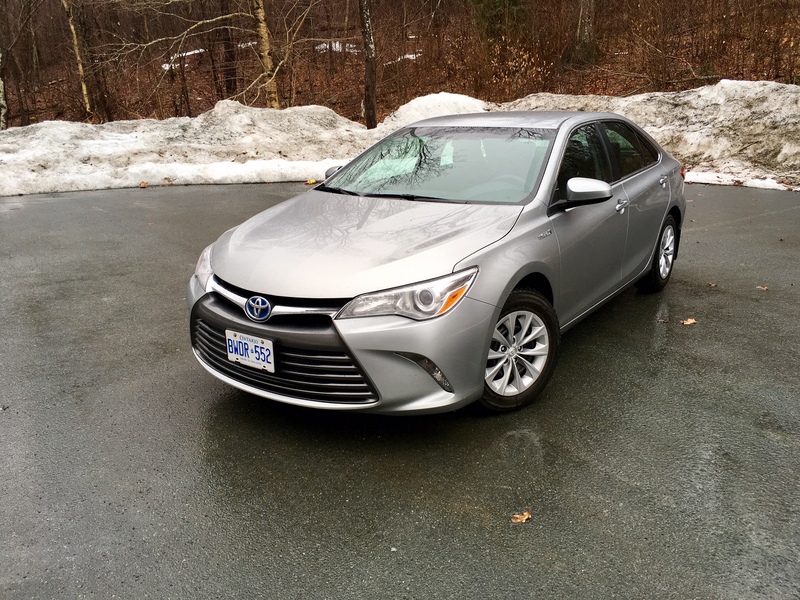 Still, once you get used to the CVT nanny, the Camry hybrid is able to propel itself decently off the line though passing on the highway can sometimes prove a bit challenging, especially if you are driving in economy mode. As you’d expect from a Camry, the ride is pleasant and decently compliant. It’s no Lexus but to be honest, it isn’t terribly far off the mark when it comes to comfort. Potholes don’t phase it much and a lot has to do with the rather soft 16-inch tires. Handling will do for most people, but the Prius out handles the Camry in the bends, believe it or not. Steering isn’t as numb as you’d expect, but don’t expect to feel truly connected to the road either. There is a back up camera to help you get into parking spaces though quality isn’t great and there is no trajectory lines. That’s okay because visibility is pretty good all around, so you could easily just back in the traditional way; you know, using your own eyes and depth perception like nature intended. 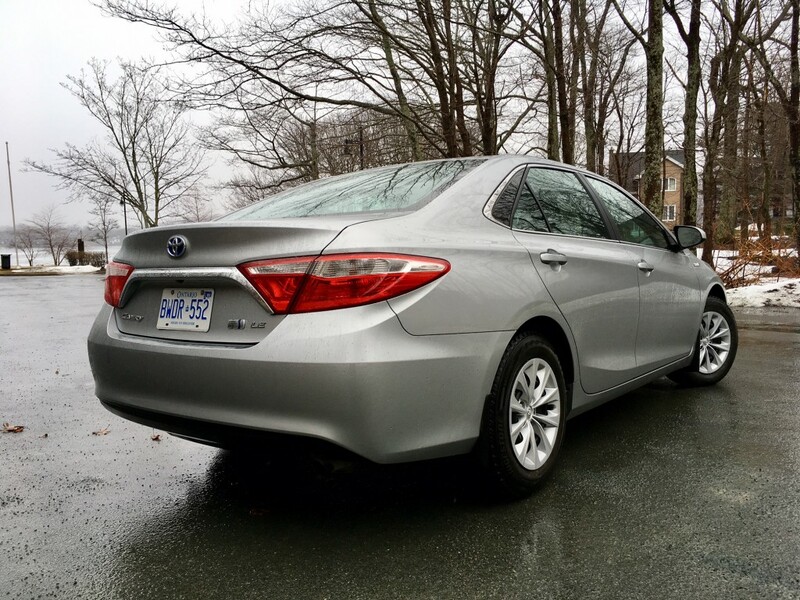 Unsurprisingly, the Camry hybrid’s ace is how little gas it consumes and for a large car, the numbers are impressive: 5.6 L/100 kms in the city and 6.2 L/100 kms on the highway. No, those numbers don’t need to be reversed. Hybrids get better mileage in the city because there is more opportunity for the electric motor to kick in than on the highway. In mixed city and highway driving, I was able to return 6.1 L/100 kms – a bit off from the 5.9 combined rating. It should be noted though, that I kept it in eco mode for 80% of my driving, so it’s a bit disappointing that I still was not able to meet or beat the combined rating, though to be far, cold weather negatively affects the efficiency of any car – hybrid or not. I usually get some sort of attention with mostly any press car I get, so driving around inconspicuously for a week was a nice change. The Camry is still near the top when it comes to spacious, reliable and comfortable family sedans and when optioned as a hybrid, you add significantly better fuel efficiency into the fold without compromising a whole lot. But I think I still prefer the Prius. 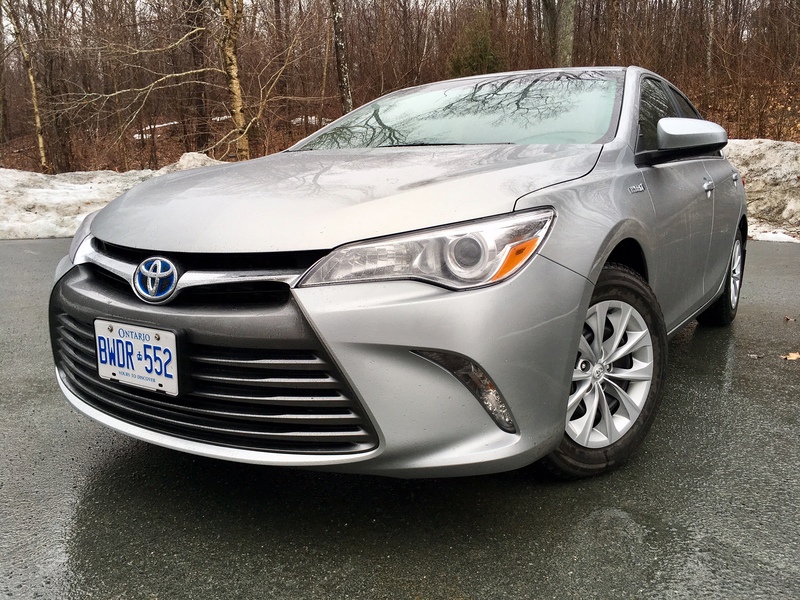 You get better mileage (4.5 L/100 kms combined compared the 5.9 for the Camry hybrid), more cargo room, decent interior room and a lot more tech. It’s a better performer in the corners. Sure the Camry has a more comfortable ride and wins hands down when it comes to exterior style (as bland as it is), but I prefer cars that have character. The Camry hybrid has none. It does its job to the best of its ability but it doesn’t do it with any flare or gusto. For me, that’s a deal breaker, but for you, it may just be exactly what you’re looking for.